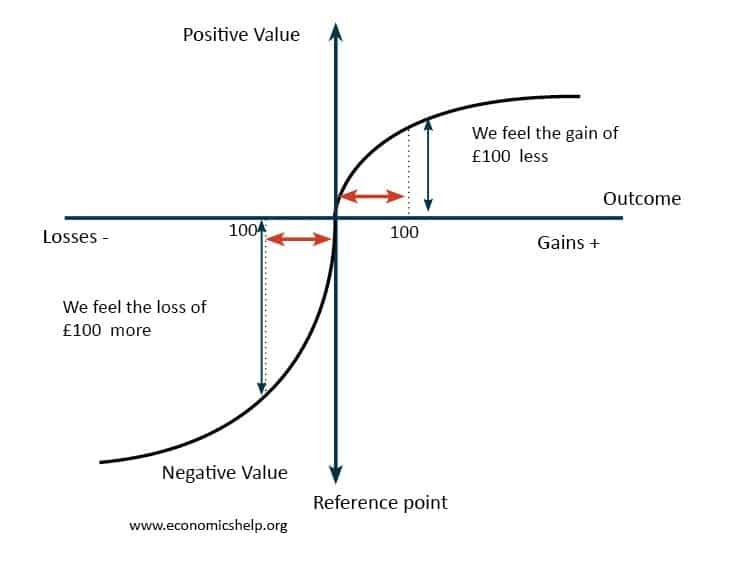 In behavioural economics, loss aversion refers to people’s preferences to avoid losing compared to gaining the equivalent amount. For example, if somebody gave us a £300 bottle of wine, we may gain a small amount of happiness (utility). However, if we owned a £300 bottle of wine and it got dropped, we would be more unhappy. Suppose we buy a stock for £1,000, but then the shares fall by 10%. We are sitting on a loss. Human psychology doesn’t like seeing a loss – so we hold onto the stock – hoping to make a profit on our decision. However, if there is bad news about the shares, it is more rational to sell and minimise our losses. Mental accounting occurs when we compartmentalise our spending. This can lead to the sunk cost fallacy. Suppose we invest £100,000 in a new software monitoring system. Because we have invested so much, we don’t want to give up on this investment. However, if the software is not working and giving consistently high marginal costs – it is better to ditch. But, we have an aversion to writing off as a loss a significant project. Free trial periods. Firms can take advantage of loss aversion through offering free trial periods. Once a consumer has the product, it becomes much more willing to give up something it has got used to. So for example, a supermarket may offer a free month trial for free delivery – when we get used to free delivery of groceries, we don’t want to give up so are willing to pay. Attachment to objects/decision. If we own something, we can develop an attachment/relationship. If a family member gave us a statue worth £100, we might feel bad about selling – even if someone offered us £200. However, if we saw the exact same statue in the shop, we may not want to pay even £10. It feels careless/bad luck. We don’t like losing because it feels like bad luck, carelessness. Image/reputational costs. If we lose, it may appear we are weak and it has a reputational cost. For example, if we invest in a project, but then give up because marginal cost is greater than marginal benefit – we may not be given another project. Therefore, it may be in our rational interest to persevere and put a gloss on the new project, rather than admit we were wrong. Kahneman, D., & Tversky, A. (1979). “Prospect theory: An analysis of decision under risk”. Econometrica, 47, 263-291. Kahneman, D. & Tversky, A. (1992). “Advances in prospect theory: Cumulative representation of uncertainty”. Journal of Risk and Uncertainty. 5 (4): 297–323. doi:10.1007/BF00122574. Status Quo Bias – a preference for existing situation, a reluctance to change because of uncertainties and costs of making new decisions.